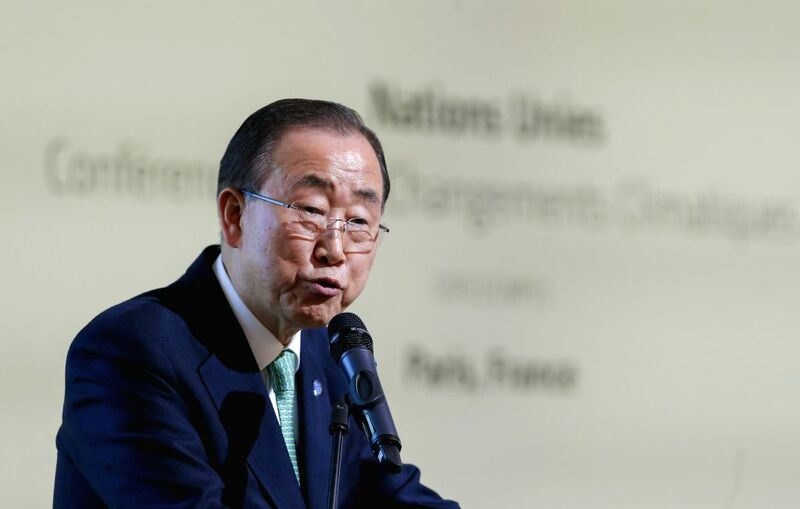 PARIS, Nov. 30, 2015 - United Nations (UN) Secretary General Ban Ki-moon speaks during the announcement of the Climate Resilience Initiative on the sidelines of the 2015 United Nations Climate Change Conference (COP 21) at Le Bourget on the northern suburbs of Paris, France, Nov. 30, 2015. Ban Ki-moon announced on Monday during the 2015 United Nations Climate Change Conference (COP 21) a new initiative in order to build climate resilience in the world's most vulnerable countries. The initiative, aiming to strengthen the ability of countries to anticipate hazards, absorb shocks, and reshape development to reduce climate risks, would help address the needs of the nearly 634 million people, or a tenth of the global population who live in at-risk coastal areas just a few meters above existing sea levels, as well as those living in areas at risk of droughts and floods, said the press release of the UN.